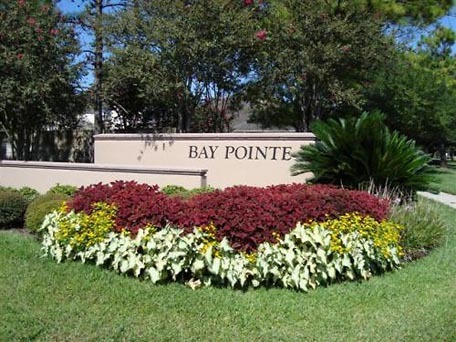 The Bay Pointe Community is located in the heart of beautiful Clear Lake. They have five very dedicated volunteer Board of Directors. These individuals work very hard on making their community a friendly, family oriented place, where anyone would be proud to live. The Board, along with volunteers, present numerous special events during the year, such as Dive-In Movie Nights, 4th of July Parade and Picnic, Back to School Splash Day at the pool and Santa in the Park. On the business side, the Board supports the enforcement of the Deed Restrictions set forth for Bay Pointe, which helps to keep the home values on a constant rise. The Board pays special attention to the beautiful landscaping and the parks, where members are proud to have their family functions. Bay Pointe is adorned with many beautiful mature trees. Unfortunately, these beautiful trees were originally planted so close together and in locations that are now causing major sidewalk and foundation issues plus sinking of some streets causing flooding in many areas of the community. The City of Houston has a very strict tree policy, specifically on removing a tree. This is creating a major hurdle for the residents who have needed sidewalk and driveway repairs due to trees that need to be removed. Recently, C.I.A. Services, the Board, many members from the City of Houston and most importantly Councilman Dave Martin and members from his office, met onsite and walked many streets in the community for an up close look at these issues. The Board is currently working closely with Councilman Martin and feels positive we are close to coming to an achievable solution for this very complex situation. Currently, the community is thrilled to see the new brick wall beautifying the community along Space Center Boulevard and Clear Lake City Boulevard. The new brick wall construction began in mid-2015 and is in the final stage of completion. Bay Pointe provides the character and warmth that does in fact come with age; with a bit of wisdom and care, growing old does not have to mean giving up. C.I.A. Services, Inc. is very proud to be Bay Pointe’s management partner and looks forward to many more years of a wonderful working relationship.